2-3pm–“Borders and Neighbors: Artist Panel Discussion” in the Biscailuz Gallery at El Pueblo Historical Monument: 125 Paseo de La Plaza, LA 90012. Presented by Craft in America, El Pueblo Park Association, and El Pueblo Historical Monument. 11am/4pm–Commerce Citywide Birthday Celebration at all local parks, Senior Center and Teen Center. All Parks and Teen Center will start at 4:00pm. Senior Center will start at 11:30am. Hot Dogs, Chips, Lemonade, Cake and Raffle Prizes…First come, first served. For more info, visit Commerce on Facebook. 10am-2pm–Arroyo Vista Family Center Covered California Enrollment Event in Lincoln Heights. Certified applications counselors will be on hand to explain the various health insurance options, help with enrollment into Med-Cal, Covered CA and My Health LA (program for the undocumented). All services are confidential& free of charge. Bring identification & proof of income for each person applying. Clinic is located at 2311 N. Broadway, LA 980031. For more info, call (323) 254-5332. 11am–Anthony Quinn Library in East LA Presents “What Is A Caregiver?” The USC Family Caregiver Support Center/LACRC will discuss the roles and support that caregivers need. Learn how to network while learning about the different roles caregivers have. Library is located at 3965 Cesar E. Chavez Ave. LA 90063. For more info, call (323) 264-7715. 3pm-12am–Night On Broadway, a Free Art & Music Event festival produced in celebration of Councilmember José Huizar’s Bringing Back Broadway economic development initiative. Takes place along several blocks of the Broadway Corridor in downtown L.A. Features live music, hundreds of artists, Kid’s Zone, food trucks & much more! For more information, including a full list and schedule of performers, visit http://nightonbroadway.la/event-info/ . 5-7pm–Reception: Recuerdos del futuro: Roaming Magu’s Chicano Dreams at LA Plaza de Cultura y Artes in downtown L.A. Gilbert “Magu” Luján (1940–2011) created art rooted in ancient legacies, civil rights struggles, and his barrio experience. Recuerdos del Futuro traces the community influences that grounded Magu’s artwork as he explored the possibilities of a Chicano future. LA Plaza is located at 501 N. Main St, LA 90012. For more info, visit http://lapca.org/ or call (888) 488-8083. 6:30pm–Los Angeles Police Commission Public Meeting at Ramona Hall Community Center in the Sycamore Grove area of Northeast L.A. Police commissioners will be joined by LAPD Chief Beck, Richard Tefank, Executive Director, and Django Sibley, Inspector General. Ramona Hall is located at 4580 N. Figueroa St., LA 90065. For more info, call (213) 236-1400. Free Oral Exams to children ages 1-16, Feb. 2 at the Arroyo Vista Family Health Center-Dental Department In Highland Park. Includes fluoride varnish & sealant if needed. Call (323) 254-5221 to schedule an appointment. Clinic is located at 6000 N. Figueroa St., LA 90042. 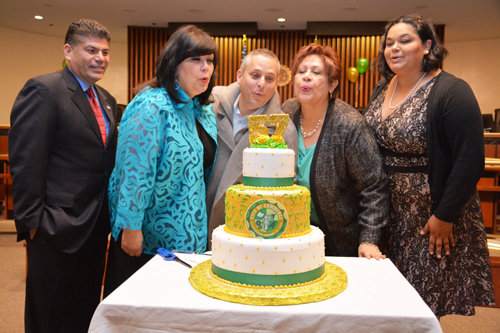 Commerce officials blow out birthday candles and enjoyed a slice of cake to celebrate the city’s 57th birthday during the Jan. 17 City Council meeting. The city was incorporated on Jan. 28, 1960.